Using iconic Peranakan shophouses on the cover of a Japanese magazine to represent Singapore. 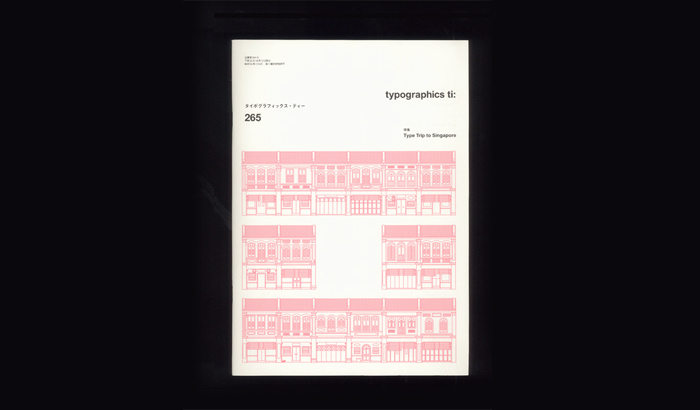 Hailing from Japan, design journal typographics published a ‘Type Trip to Singapore’ issue, featuring their favourite type-extraordinaires in the local design scene. Provided with the journal’s cover as a canvas, the traditional shop house was the decided stimulus. Ranging from simple ornamentation to the wildly eclectic, colourful Peranakan style, the façades are tell-tale signs of Singapore’s heritage, while its occupants today range from small design studios to independent shops – juxtaposing the old-world charm with a breath of fresh creative air.